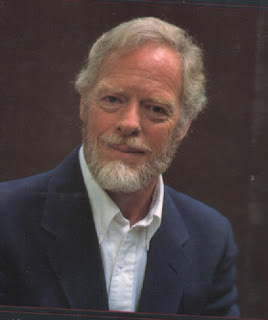 James Alexander Thom is the author of many historical novels, including Fire in the Water and Saint Patrick's Battalion, and the writing guide The Art and Craft of Writing Historical Fiction. He also worked as a journalist and taught at the Indiana University Journalism School. He lives near Bloomington, Indiana. Q: How did you come up with the idea for Fire in the Water and for your character Paddy Quinn? A: I had long been aware of the horror of Andersonville Prison because my great grandfather survived it. My fascination with steamboats began with Mark Twain, and for several summers my wife and I were historical lecturers on river cruises of the Delta Queen line, which provided opportunity for much technical research, and familiarization of the waterways. I thought the tragedy of the Sultana was too little known by Americans, as it took more lives than the Titanic, and I felt the especial poignancy: that the sickly ex-prisoners had been keeping themselves alive by their hope of getting home. 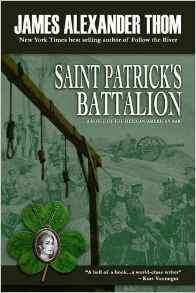 The protagonist Paddy Quinn already existed in my fiction, having been an Army camp errand boy during the Mexican War, in my preceding novel, Saint Patrick's Battalion. The boy Quinn's diary carried much of the narrative of that novel. 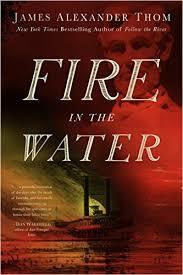 Fire in the Water often refers back to those formative years of Paddy's life. By the time I undertook the Sultana story, I knew that the grown-up Quinn would be the ideal protagonist, as a Harper's Weekly war correspondent with Paddy's Irish traits. 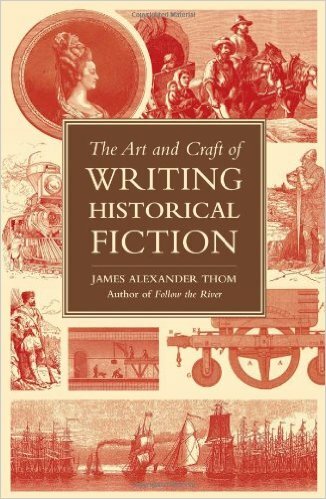 Q: Among your other books is The Art and Craft of Writing Historical Fiction, a guide for other writers. What do you see as the right balance between history and fiction when working on a historical novel? the historical facts, as completely as they can be determined by deep research into the events and the real historical characters. Once that is achieved, the author might introduce fictional characters, through whose senses and thoughts the reader can experience and understand the events – like being there. But the fictional characters must not be allowed to change the actual history. Most of my novels have been about, and from the point of view of, the real historical characters themselves. My early books had no fictional entities. But I came to understand that a memorable fictional protagonist with his (or her) plot within a story can enrich the emotional and philosophical gist of the story, help interpret another culture, enhance the irony or humor of the true story, and so on. Q: What type of research did you do to write Fire in the Water, and was there anything that particularly surprised you? A: Aside from the technical and environmental research mentioned above, I wanted to convey the very personal aspects of being a soldier -- the nasty, miserable, demeaning experience of life at war -- and the kind of bond that such fellow survivors share. I believe that too much war fiction emphasizes the so-called "glory" of soldiering. War in actuality is man's most disgusting creation, and tends to bring out the worst in everybody. Therefore I researched for the base details and the daily obscenities in soldiers' and prisoners' existence. I know from three years in the Marines that most conversation is about excrement, copulation and getting drunk, but I needed to find the slang, idioms, and peculiar customs of the Civil War era. The severity of military discipline in those days is almost unimaginable. For such details, soldiers' correspondence and diaries are helpful. Then there was that particular circumstance that it was a war between countrymen, not against a foreign enemy. The blue and the gray had to maintain their own propaganda about each other in order to kill men who were basically just like them. Much of that still lingers. And always in the story there is the undercurrent of slavery, something we can hardly imagine, but mustn't forget. A: When I start writing, I think I know the ending, but it may change during the process. That's because writing demands such hard thinking that the author eventually knows more of what's important than he did when he started. And, yes, distinctive characters like Quinn and Macombie can insist on showing their version of themselves instead of the author's. They can get out of control, and that's usually a good thing. A: I'm trying to resume the writing of an American Indian novel that I set aside years ago to work on the Paddy Quinn books. It's historical, but not confined to the past. It has real Indians in it, both alive and ghosts, and there will be roles in it for Paddy Quinn. I can't seem to get rid of him. Its working title is "The Bones of a Hopeful Indian." the Water is Abraham Lincoln, although he's dead when the book begins. Quinn and Macombie keep each other alive because of their vow to get to his funeral. I work years on a book because a story has inspired me so much I need to share it. Inspiration doesn't necessarily derive from Happy Endings. There aren't many of those in real life. And I always write with Twain's remark in mind: “The difference between history and historical fiction is, fiction has to be believable."